More than 142,000 cubic metres of sewage was discharged into the sea during illegal spills in 2016 and 2017. The windfall will be used to fund environmental improvements in and around the coastal town of Swanage. The package offered by Wessex Water, the highest ever in the UK, includes £400,000 towards a local authority flood defence scheme in Swanage, £400,000 to Dorset Waste Partnership to fund the development of a doorstep recycling service for domestic fat, oil and grease, £100,000 towards the Dorset Litter Free Coast and Sea Project, £75,000 to the Durlston Country Park and Nature Reserve. The company also offered £25,000 compensation to Swanage RNLI Lifeboat Station as an impacted third party, taking the total pay-out to £1 million. Wessex Water made the offer as part of a legal agreement known as an Enforcement Undertaking (EU) which is a form of Civil Sanction. An EU involves a company or individual offering to put right what went wrong and compensate people and the environment. After careful consideration, the Environment Agency accepted Wessex Water’s enforcement undertaking on the basis that the company accepted breaching the legislation and payments totalling £975,000 would secure improvements to the environment including flood defence and measures to tackle fats, oil and grease - which can cause pollution to rivers and coastal waters if poured down the sink. "When water companies damage the environment by illegally polluting water the Environment Agency will take tough enforcement action against them including civil sanctions. "This record pay-out will secure a range of environmental improvements for the local community, tourism and future water quality." Swanage town centre falls within a flood risk zone where temporary defences are deployed to help protect local business and property. The contribution offered by Wessex Water will benefit local residents and businesses by improving the level of flood protection in the town. The financial contribution to Dorset Waste Partnership (DWP) will fund the development of a doorstep recycling service for fats, oil and grease. The money will be used to help determine the facilities needed for the service and fund additional resources to assist with recycling. The donation to Durlston Country Park will enable provision of equipment for animal surveys and raise awareness and promote management of the rich local environment. 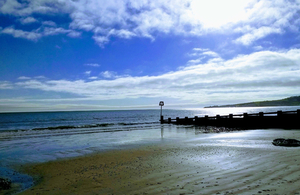 The financial pay-out arose from a series of unconsented discharges from Swanage Sewage Treatment Works into Swanage Bay where it is estimated more than 142,000 cubic metres of sewage was discharged into the sea.